Finally, got my computer hooked up to the ‘net, and I’m almost finished with moving. Yipee. This fold was actually the first fold I did that had four limbs and actually resembled something. 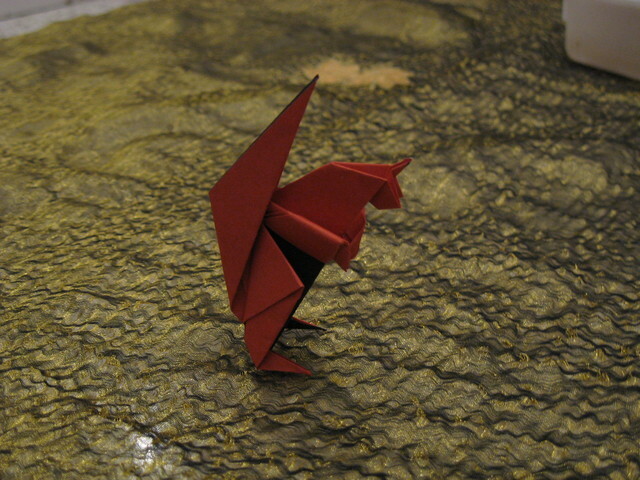 Although the proportions are not the best I still like this fold. It is not really complicated, and once you get the trick of the wings, you can get to it from the bird base quite easily. The same technique is also very useful for creating other four legged creatures (some of which I will also show). (click on the image for folding instructions). This entry was posted in Origami, Personal and tagged folding instructions, Origami, squirrel. Bookmark the permalink.